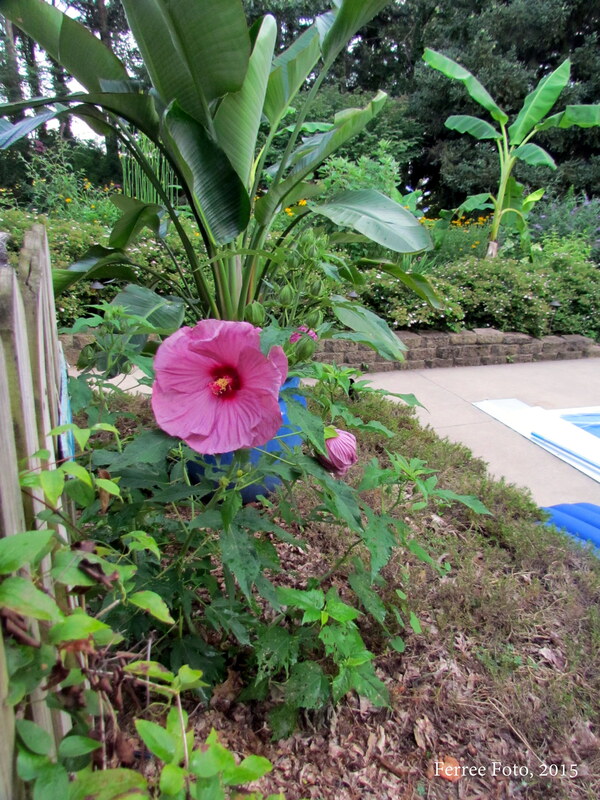 Have you noticed the huge hibiscus blooms this summer? Hibiscus has magnificent flowers that make quite an impressive display each summer. There are many different types of hibiscus. The rose-of –Sharon (Hybiscus syriacus) is a popular shrub hibiscus. Herbaceous perennial hibiscuses are available in tropical and hardy forms. Tropical hibiscus (Hibiscus rosa-sinensis), with its glossy lobed leaves and brightly colored flowers, does not overwinter here. 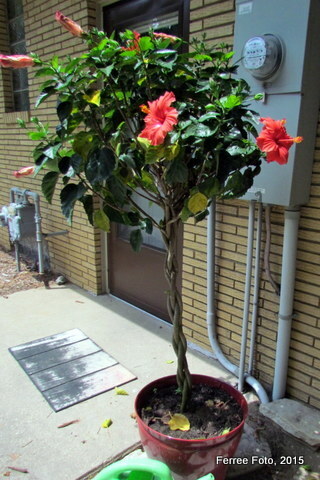 My sons gave me a tropical hibiscus tree for mother's day this year. It looks like a pom-pom of bright orange blooms on top of a three foot braided trunk. It has done well for me, if I remember to water it every day! I hope to overwinter it as a houseplant. Fortunately there are many wonderful options of hardy hibiscus available for us to use in central Illinois. 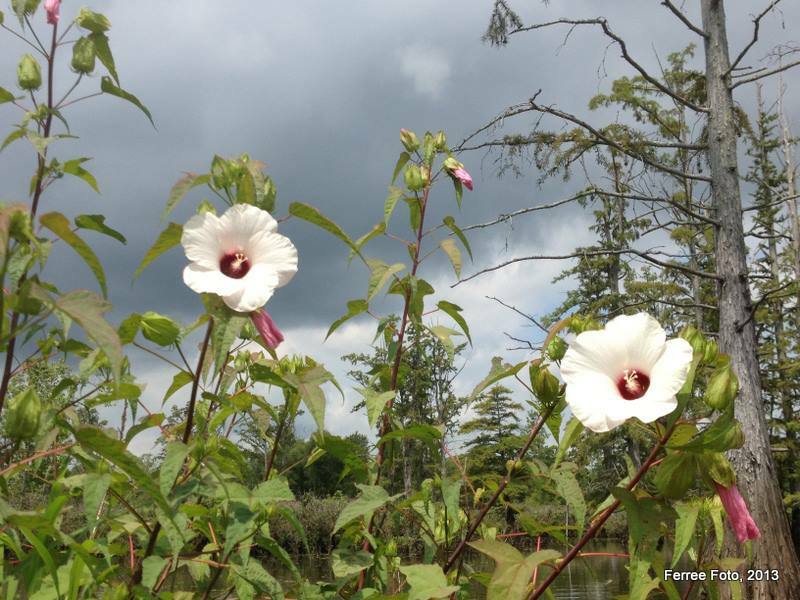 In fact, hardy hibiscus (Hibiscus moscheutos) is native to Illinois. Hibiscus, also called Rose Mallow or Wild Cotton, is a fast, strong-growing perennial. It usually grows to 5 feet tall, but in proper conditions can reach 8 feet in height. The plant grows about 3 feet wide, but does spread into larger patches with years of growth. The flowers are this plant's claim to fame. The large, showy, funnel-form flowers are 5 to 9 inches across. Flowers appear singularly on long stems that come from the leaves. Flowers appear from mid-July to frost but are heaviest in August and September. This is a very easy plant to grow. I have several patches of red and white flowering plants that I inherited from the previous homeowner. They grow well for me in my dry, sandy soil. In fact, this plant seems to love heat and full sun in spite of the fact that its native habitat is wetland areas such as swamps and marshes. Consequently, its best performance will occur in wetter areas, but it is very tolerant of drier soil. It also does best in full sun but tolerates light shade. Plants can be started with seeds, plants, or division. Once the plant is established, it can be left undisturbed for an indefinite period, because the plants do not spread underground. They do self-sow seeds though and can spread that way. Divide in the spring. The only other care these plants need is to cut back old flowering stems in fall or spring. For something new, try one of the many wonderful hardy hibiscus hybrids now available. Many of these are the result of long breeding programs combining several native species. Proven Winners has a new hibiscus called Summerific 'Cherry Cheesecake' that has striking 8 inch white flowers with cherry-red eyes and magenta veining. My Summerific hibiscus blends nicely with my other tropical plants around the pool, where it stands between a bird-of-paradise and three different elephant ear plants. Some of the biggest flowers come from the old standby Southern Belle Mix hybrids. This 4-feet tall plant has 10 ½" flowers in red, pink, and white. 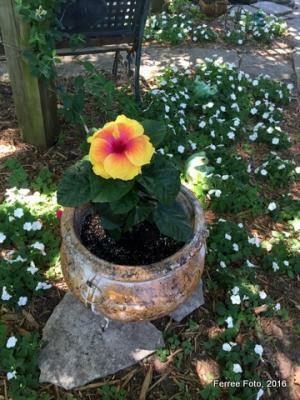 Also stunning is the "Turn of the Century" Hibiscus with 8- to 10-inch blooms. It has unusual, bicolored flowers with pale pink on one side, deepening to red toward the other, suggesting a spinning pinwheel. For more information on this and other perennials, go to University of Illinois Extension's website "Gardening with Perennials" at http://urbanext.illinois.edu/perennials.